I've had many friends visit the Maldives over the years, and they all rave about it nonstop when they get back. This tiny archipelago in the Indian Ocean just off the coast of Sri Lanka and southern India sure does look amazing in everyone's photos. But it's also quite far from North America and nearly in the middle of nowhere. Can it really be worth all the hype? When I visited there recently as winter began to rage back home in the States, I settled this question for myself once and for all - absolutely! 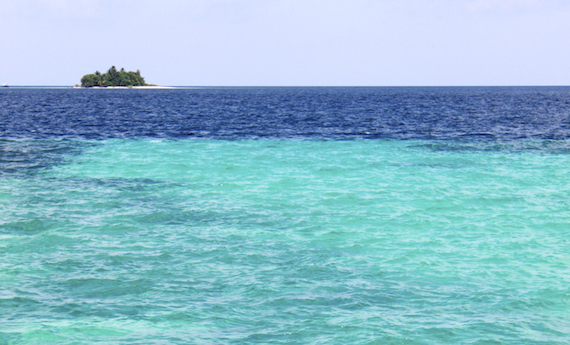 The Maldives is like a mythical place in many ways. It's where you always hear of Arab princes going to party in private. It's where American celebrities go for secret weddings. And European royalty jet off there for secluded vacations out of the reach of paparazzi. 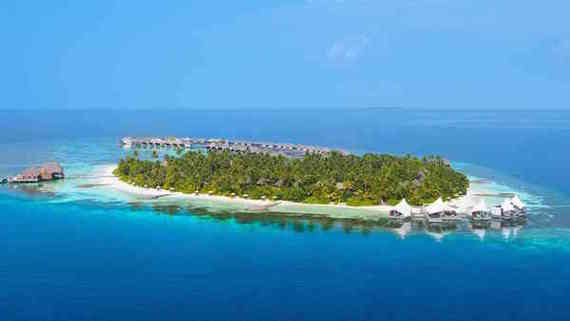 This returning clientele should give you a hint of one of the major take-aways from my recent Maldives vacation fantasy - it's an expensive destination. But surprisingly, flights to get to these islands are actually pretty affordable. The only other American couple I met there told me they snagged a round-trip fare from New York City for under $900. But the luxury hotels on the private islands can be a bit pricey. Most surprising of all was that the meals on these resorts are also really expensive, to the tune of $100-150 for a filling meal for two plus a few drinks. That's because nearly everything they have and serve on the islands has to be imported. That adds up. With that warning out of the way, the Maldives is a country totally worth saving up you miles, points, and/or dollars to experience. It's literally like you're living inside of your computer's stock exotic tropical island screen saver. By the time you leave, you'll have schemed and brainstormed dozens of ways to convince your employer to let you move there and work remotely. Or you'll just want to quit your job and become a resort worker there for six months or a year, like we were plotting to do only a few days into our stay. My fantasy Maldives experience started out with my arrival at the tiny nation's only international airport in the capital of Malé. Malé is technically the smallest capital city in the world. Although I didn't explore it on this trip, it looked so cute from the air and from afar. The airport is on an island adjacent to the capital's island, and for a small airport on a tiny island adjacent to the world's smallest capital in a tiny island country in the middle of the ocean, some pretty decent sized long-haul jumbo jets can land there. It's a popular destination the world over and many major airlines service the country, which is probably the reason that it's still quite affordable to fly there. After landing in Malé, that's where the normalcy ends and the surrealism begins. I had never taken a sea plane before - until the Maldives, that is. Most of the resorts there are out on the bazillion tiny islands scattered throughout the archipelago, and most of them are only accessible by sea plane or speed boat. 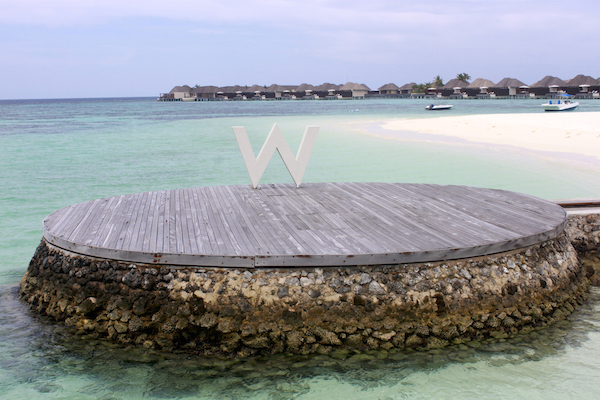 On this trip, I stayed at the W Retreat and Spa Maldives, which has its own private island just a short 20-minute sea plane ride from the airport. The sea plane was booked in conjunction with booking the stay at the resort, and transferring was super easy since the Malé "water runway" was just around the corner and a short shuttle ride from the land runway. 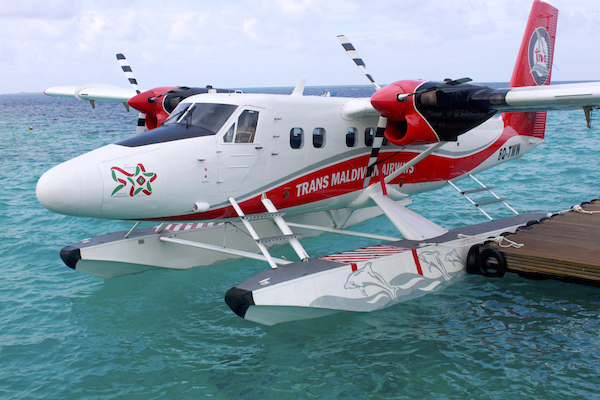 Trans Maldivian Airways (TMA), the nation's public inter-island air carrier, is the world's largest operator of sea planes. Although the relaxed nature of the pilots and staff may throw you off (both the pilots and the flight attendant took their sandals off mid-flight), they are the undisputed global sultans of sea plane transport. TMA operates roughly 120,000 flights and carries nearly a million passengers per year. After 20 minutes of scenic flying over a portion of the Maldivian archipelago, including through several minute-long hard rain showers that made our fellow passengers (ok, me) nervous but which didn't seem to phase the experienced crew, we descended upon a lush green, turquoise, and azure collage below that turned out to the the W's private island. We landed smoothly on the water near the island's welcome dock and were greeted by a cadre of resort staff who were expecting the twice-daily flight onto the island. About 10 of them were lined up and waiving at the arriving plane when we taxied up. It could not have been a more adorable welcoming scene. Many of the resorts on private islands in the Maldives feature two types of accommodations - beach-front villas and over-water villas. Most of those also include their versions of uber-swank luxury mega villas as well, and ours was no exception. I asked the staff of the W to show me one of these insanely glamorous villas and they happily obliged. Needless to say it was as luxurious and spacious as expected, especially given that it was newly renovated. With multiple bedrooms, large common spaces, and a huge private pool overlooking a nearly 360-degree view, this villa and it's similarly styled neighbors are simply palatial for such a secluded location. And while these certainly are not cheap, the fact that they sleep 6-8 means that friends could split the cost quite reasonably and really live it up. With that said about the Grande Dame of the island's villas, ours was a beachfront one-bedroom with an open-air sitting room on a second floor above the bedroom, all overlooking our private pool, tropical gardens, cabana deck, and a beautiful white sand beach. The spacious bathroom featured a jacuzzi tub big enough for two (or three) people, a separate shower area, and even an open-ceiling rock garden. Not too shabby at all. In fact, it was one of the most unique resort rooms I've experienced. And despite the remoteness of it all, modern amenities such as ice cold air conditioning (perfect for fending off the humidity), satellite tv, an indoor/outdoor sound system, and super fast wi-fi were all available to us there too. For such a small island serving so few guests, there were three full-service restaurants, two separate bars, and even a small night club. And given that it was the W, there was an ever-present DJ spinning light house beats at breakfast, throughout the day by the pool, at the bar in the evening, and of course in the island's night club much later for those with an urge to rage in the middle of the ocean. 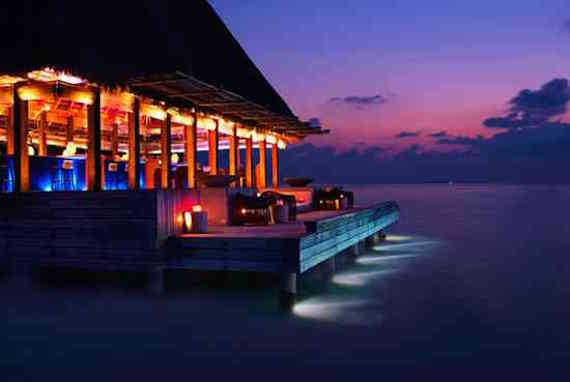 As previously mentioned, dining on the resort islands in the Maldives can be an expensive endeavor, since nearly everything on the islands has to be imported frequently. So budget accordingly so that you're not surprised and stressed. However, the food is remarkably high-quality and delicious. 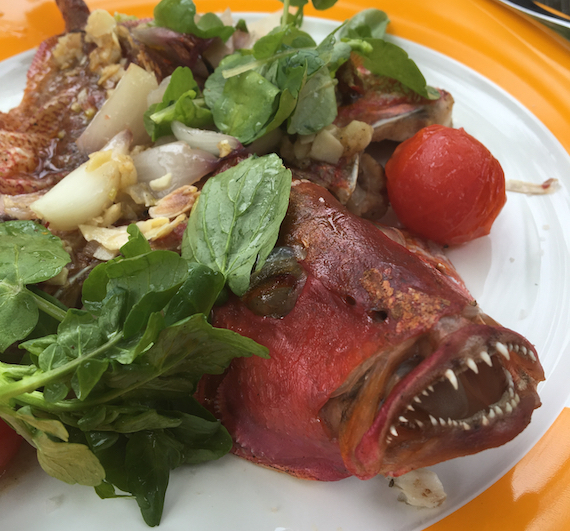 We dined on more seafood than I've ever seen or eaten in my life, all of which was wonderfully presented for maximum aesthetics to accompany the equally stunning flavor. Even if you're not into seafood, there are plenty of other culinary options. My favorite restaurant featured tables set in a shallow pool such that your feet are dangling in cool water while you're sitting at the table and dining. Kayaking just off the coast is also gorgeous, not only because of the beauty of the clear water you're paddling through and the colorful reefs below (I would highly recommend a clear-bottom kayak), but also because you get great vistas back toward the lush island and its beaches. There's also parasailing, paddle boats, several terrestrial pools (don't forget about your private one back in your villa too), guided boat trips, gyms, beach yoga, and everything else you can imagine at top notch beach resorts. And many of these activities are actually free for guests at the major resorts here, so you can partake as much as you want. One of the many advantages of vacationing on a small island is the views of the sunrise and sunset every day. I'm not a morning person by any stretch of the imagination, so I never managed to catch a sunrise, although I hear they're sheer bliss. But the Maldivian sunsets are absolutely incredible. At the W, of course, the resident DJ always sets the mood in the evenings at Sip, which is the western-facing bar specifically designed for watching sunsets. This was a favorite spot of ours to unwind after a long day in the water and a nice long shower or bubble jacuzzi bath in our villa's zen garden. As if there aren't enough ways to relax and pamper yourself in your own villa, spas in the Maldives are especially spectacular because they usually take advantage of their locations and combine elements of island life and the ocean into the facility and the treatment packages. 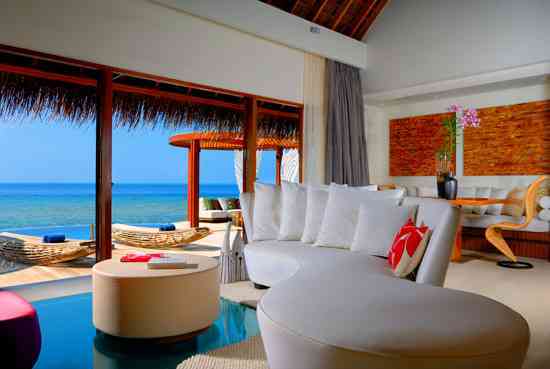 At the W, the massage rooms opened out over the water while still maintaining complete privacy through clever design. These rooms also include hot tubs for more post-massage relaxation and are perfect for a relaxing romantic couples experience. However the full Maldives experience is one that I know I'll never forget, one that I hope to repeat, and one that I'd strongly recommend you add to and quickly check off your travel bucket list as well. And when you do, save up and go all out. The full private island resort experience, like ours at the W Retreat and Spa Maldives, is not to be missed. For more stories and photos from my fantasy Maldivian adventure, check out AIRistocrat.com.